This is a merry little cascade that starts as a drop and then runs into a series of shallow slides across the bedrock. It's fairly easy to get to and close to town, which makes it easy to recommend, but it's not one I'd drive long distances just to see. The trail down Shope Creek on the other side of the falls is nice and worth exploring. 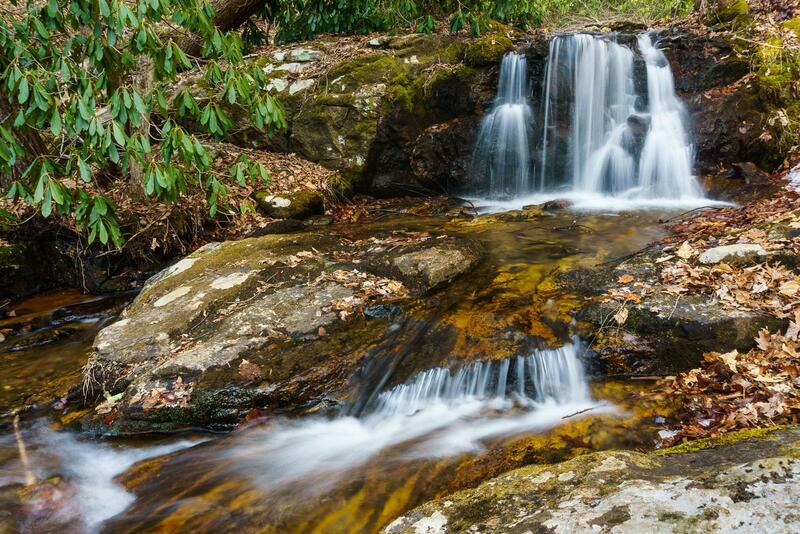 I've seen several references to Forrest Falls as the name for this one on the Interwebs, and it looks like Carolina Mountain Club members named it that after Dr. Tim Forrest, who is a Biology professor at UNCA, so I've always used that name myself. The Forest Service tasked Dr. Forrest with implementing an aquatic insect monitoring program in Shope Creek in their Environmental Assesment of the Shope Creek project. Giving the falls this name, after someone who cares enough about the environment here to have their name attached to a Forest Service plan for the area, is quite appropriate in my opinion! From Asheville, NC, go east on I-240 to Exit 7, Tunnel Road. Go east on Tunnel Road/US 70 and go 2.0 miles. Turn left onto Riceville Road - it's at the light at the McDonald's/Ingles shopping center. Go 3.7 miles on Riceville Road. Just past the Riceville Fire Department & Community Center, turn left onto Bull Creek Road, then bear right almost immediately up onto Shope Creek Road. Go 2.3 miles to the end of Shope Creek Road, where the road dips across the creek on a low-water bridge. It's another 0.1 mi. straight ahead on the gravel road to the parking area, on the left. Start the hike by going around the gate and up FS 220 through the stand of white pines. The gravel road ascends gently to a fork just past a huge oak tree on the left. Take the left fork, onto FS 220A. This logging road gets a bit more inclined, but is by no means "steep". You'll enter a recently logged area; look a turn-off on the right at a set of boulders. It's unmarked, but it's the only significant, well-used trail leading right into the woods toward the stream. This is just before the road makes a left hand curve and ends. Follow this old road down a short distance to a crossing of a tributary to Shope Creek. It then starts back uphill - it gets moderately steep and rocky for a short distance here. Nothing too difficult. Look for yet another right-hand fork (the well-used trail) onto yet another old logging road just ahead. It's a short distance on that road, nearly level, to the falls on the right. For a closer view, cross the creek above the falls and descend the bank on the far side.